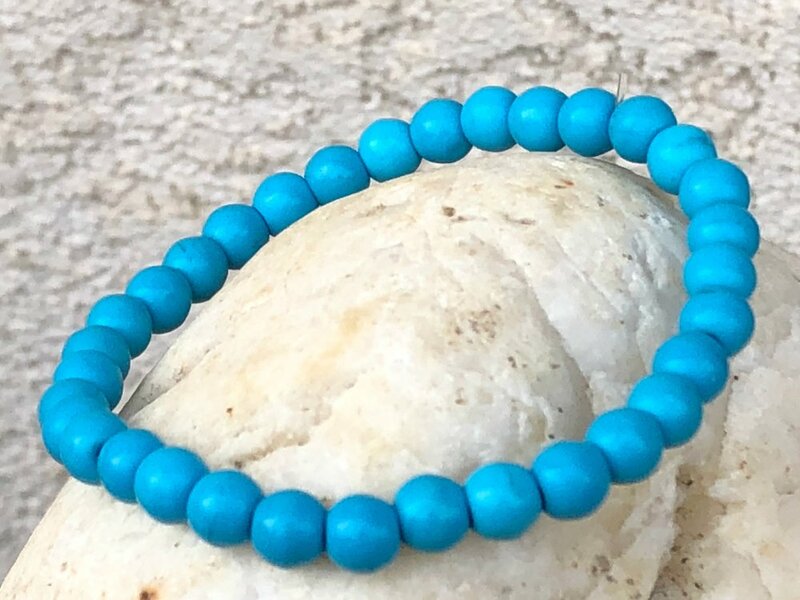 Gemstone bracelets increase positive energy and reduce physical and emotional discomfort, they help us stay connected and aware. Gemstone jewelry enhances and improves the manifestation of goals and desires. Let your light shine and raise your vibration, with Natural Healing Gems. Learn about gemstone meanings and metaphysical benefits HERE! Blue Howlite is an "Attunement Stone," (meaning it provides a link to higher-consciousness). Howlite dismisses critical thoughts and opens the mind to receive wisdom and spiritual insight. This gemstone is perfect for dream-work, improving memory, and figuring out ambitions. It encourages patience and calms uncontrollable anger. It decreases rudeness and offensive behavior, including selfishness and resentment. Blue Howlite assists in gaining personal insight and strengthens positive personality traits. Blue Howlite is a wonderful gemstone for those who suffer from insomnia, anxiety, physical pain, leg cramps, and stress related issues. It relieves muscle tension and helps the body absorb calcium, making it beneficial for bones and teeth. Osteoporosis, Insomnia, Bones, Teeth, Cramps, Pain, Anxiety, Calcium Absorption, Ulcers, Skin Rashes, and Heart Problems.